I probably would have tried to put a softer spin on it, but I get where the man who gave us Lake Wobegon is coming from: pumpkin pie can be pretty boring. I know more than a few people who consider it almost an obligation to indulge every fall, compelled less by love than out of respect for tradition. How did it become so? And why do so many of us feel as if pumpkin is America’s most overrated pie? Plenty of reasons, starting with pumpkin itself. When was the last time you ate a spoonful of plain pumpkin, canned or fresh? It pretty much tastes like…well, your guess is as good as mine. Creamy? Sure, when you add cream to it. Spicy? Ditto, after you shake in the cinnamon, cloves, ginger and nutmeg. Sweet and rich? That would be thanks to the sugar and eggs. Without an awful lot of help from the supporting players, in other words, pumpkin wouldn’t come close to making the A-list of American pies. But we need to do more. The bottom line, my fellow pie makers, is that pumpkin pie needs our help. We must do what we can to lift pumpkin pie up and align it with our aspirations for it, even if that means challenging purist pumpkin pie dogma. Pumpkin pie needs a makeover. And we’ve got just one short season to do it in. As for the filling, the lesson here is that sometimes you have to share the limelight in order to bask in it. 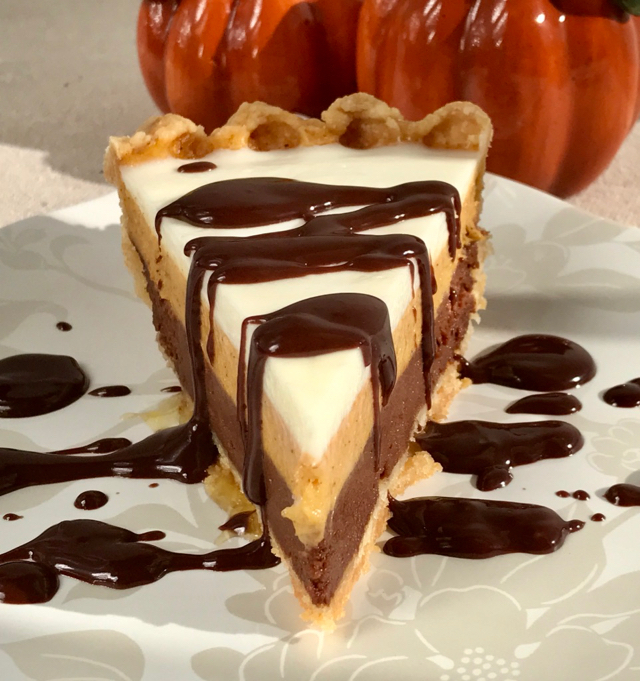 You’d be forgiven for thinking that the layer of chocolate filling – made from part of the pumpkin batter plus melted semisweet chocolate – would steal the show. But it doesn’t. Instead, it creates a harmony where the pumpkin shines. The Garfunkel to Simon’s pumpkin. On top we have a layer of sweetened sour cream, just a touch of tartness to play off the sweetness of the other layers. Pretty, isn’t it, like the flag of some multicultural pumpkin nation. 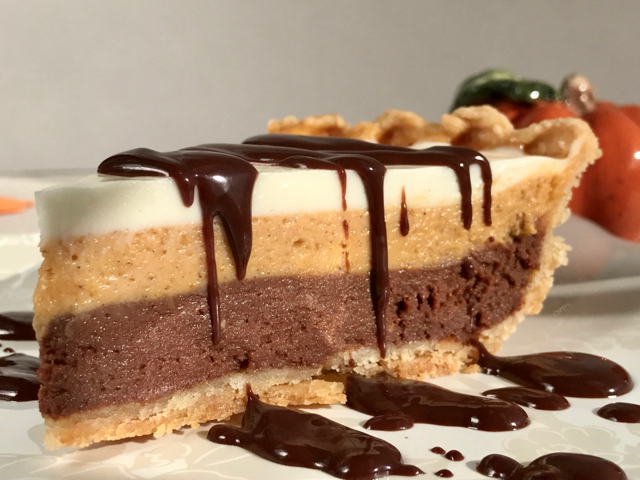 If the chocolate and pumpkin fusion still seems like too much of a stretch, consider the Creamy Pumpkin Cheesecake Pie or the Maple Pumpkin Pie. The thing to remember is that you don’t have to settle when it comes to pumpkin pie. The best ones can outshine the worst, even the mediocre ones, by a country mile, something to keep in mind as we enter peak pumpkin pie season. Are you missing some of Ken’s books in your personal cookbook collection? Or maybe you’ve enjoyed one of Ken’s books for some time now and you’d like to share that enjoyment with a cook on your holiday shopping list. Now would be a good time to do something about that. For the next few weeks we’re running a pre-holiday special on all of Ken’s books: just $3 for shipping no matter how many books you order. This offer is only good in the lower 48, and all books will be shipped by media rate (which takes a few more days than priority mail.) If books are mailed to more than one address, it’s $3 per address. So if you know someone who loves to bake with fruits, veggies, and herbs, The Harvest Baker would keep them busy long after the holiday season. Ken’s Comfort Food is the perfect gift for anyone who loves to putter away in the kitchen cooking up delicious dishes for family and friends. Of course, Pie – voted one of the top seven baking books of the past 25 years by Cooking Light magazine – will inspire even the most experienced pie maker out there. 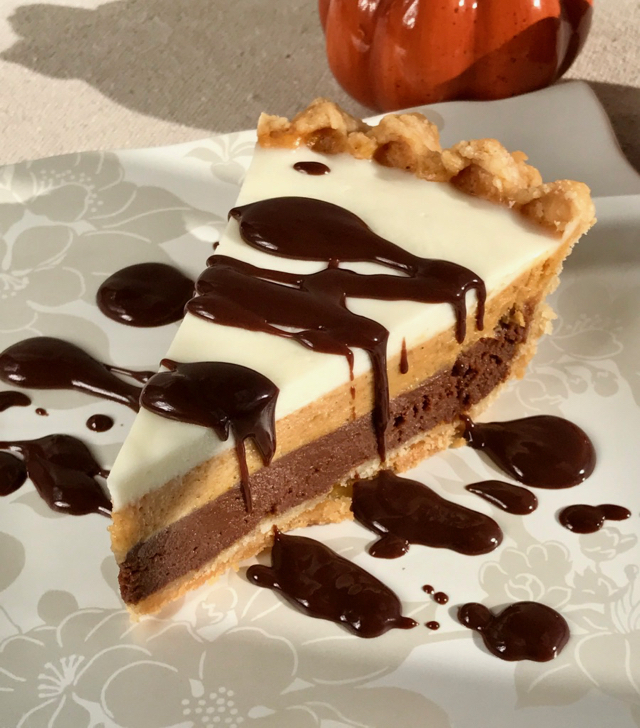 And if you or your pie maker are just starting out, you can give a gift of Ken’s popular No-More-Tears Pie Pastry Course to jumpstart a pie career. And Dinner Pies will put the savory into every pie maker’s repertoire. You’ll find all of Ken’s book in our online store, but here’s the deal: to get this special rate, don’t order the books through the store. Instead, send us an email, tell us which books you want and where to ship them. If you’d like us to add an inscription for someone in particular, tell us that too. We’ll invoice you through PayPal, or you can send us a check. The address is The Pie Academy, P.O. Box 7926, Wilmington, NC 28406. Thanks a bunch. You’ll be glad you took us up on this deal when the holidays come and you’re ready to share the love with all your favorite cooks. On a sheet of lightly floured wax paper, roll the dough into a 13-inch circle. Invert the pastry over a 9 1/2-inch deep-dish pie pan, center it, then peel off the paper. Gently tuck the pastry into the pan without stretching it. Sculpt the overhanging dough into an upstanding ridge and flute, if desired. Prick the bottom of the pie shell 6 or 7 times with a fork. Refrigerate for at least 30 minutes or place in the freezer for 15 minutes. Reduce the oven temperature to 350°F. Place the butter in the top of a double boiler set over, not in, barely simmering water. The water should not boil. When the butter is partially melted, add the chocolate. Heat for 5 to 10 minutes, until melted, then stir gently until smooth. Remove the top of the double boiler and set the chocolate aside to partially cool. Using an electric mixer, cream the cream cheese on medium speed in a large bowl, gradually adding the sugar. Beat in the eggs, one at a time, then blend in the pumpkin, vanilla, spices, and salt until evenly combined. Pour about half of this filling into a separate bowl and stir in the melted chocolate until evenly blended. Pour the chocolate filling into the pie shell and smooth with a spoon. Bake on the center oven rack for 20 minutes. Transfer to a cooling rack and cool for 15 minutes. Slowly - so you don't disturb the chocolate layer - pour the remaining plain pumpkin filling over the chocolate layer, gently shaking the pan to settle the filling. Return to the oven and bake until the pumpkin layer is set, about 35 to 40 minutes. When done, the perimeter of the filling will puff a little, but not so much that it develops large cracks. Transfer to a rack and cool for 30 to 45 minutes. Make the topping: combine the sugar and sour cream in a small saucepan. Heat the mixture over moderate heat, stirring, for 3 to 4 minutes, until it turns soupy and a little warmer than body temperature. It shouldn't get too hot or it will separate. Carefully pour the sour cream over the middle of the pie, then immediately shake and tilt the pie so the topping covers it evenly. Return the pie to the rack and continue to cool for several hours. Refrigerate for at least 3 to 4 hours before serving. Store in the refrigerator, loosely tented with foil. Makes 10 servings. NOTE: When I prebake a pie shell, I'll often bake the shell on the lower rack for the first 25 minutes, then move it up to the middle shelf for the next 10 minutes after I remove the beans.